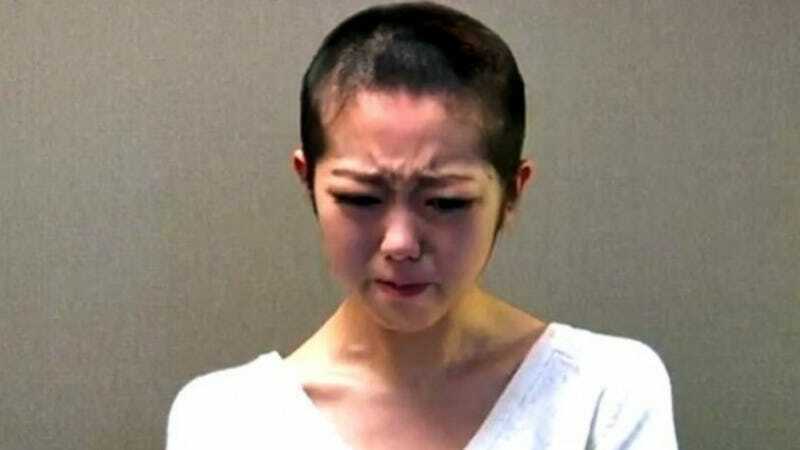 Last week Japanese pop star Minami Minegishi, 20, one of the members of the popular girl group AKB48, shaved her head and filmed a tearful apology video to fans (since made private) after she was caught leaving her boyfriend's house on the morning of January 17th. One of the rules of the supergroup, which features 90 girls of varying ages broken down in smaller factions, is their no-dating policy. The boyfriend, Alan Shirahama of fellow pop idol band Generations, has also apologized ("I'm so sorry for the trouble I've caused. I will do my best from now on through several activities, so please continue to support me"), but the statement only came after netizens—the community of the nation's pop idol fans on the Internet—criticized Shirahama after his agency released a statement about how his private life is for him to decide. Even from the outset, Minegishi had no such defense. "You think you love them, but then you see Tiffany point directly at you and wink, and everything else that exists in the world just disappears. [...] You think you love them, but then you see Sooyoung look you dead in the eye and say in English, ‘Thank you for coming.' I might not know how much I love these girls." For pervy, try the J-pop group AKB48, a Japanese girl ensemble, with scores of members, who, affecting a schoolgirls-in-lingerie look in their video "Heavy Rotation," pillow-fight, kiss, and share heart-shaped cookies mouth to mouth. [On the other hand, K-pop group] Girls' Generation is a group of preppy-looking young women in skinny trousers. When they wear hot pants, it's to display the gams, not the glutes. In other words, if K-Pop girls make their male fans feel special in a prepubescent-dating way, like they'll hold hands and go skip pebbles with them, and only them, the attitude that fans have cultivated towards members of the basically-softcore AKB48 would be markedly more sexually possessive. This might explain the dating ban as well as the shame that's rained down on Minegishi, who's in now in the midst of an unfair shitstorm for simply spending the night with her boyfriend. Both K- and J-pop rely heavily on a "star factory"-style training academy hosted by record labels that handpick and rigorously mold girls and boys as young as twelve into experts on performance routines, lifestyle choices (e.g. the no-dating rule) and press etiquette. As a punishment for breaking the rule, Minegeshi has been demoted back to "trainee" position, a number of ranks below her previous place in AKB48, meant for novices who must work their way up. Minegeshi has since appeared at performances as a trainee, wearing a wig.